On Saturday evening, UFC announced a highly-anticipated Middleweight rematch for their upcoming return to Madison Square Garden in New York City. Former UFC Middleweight Champions Chris Weidman and Luke Rockhold will “run it back” when the Octagon touches down in MSG for the second time in history in November. UFC announced during the UFC 228: Woodley vs. Till pay-per-view broadcast, and via their various social media channels, that Weidman-Rockhold 2 is confirmed for UFC 230 on November 3rd. Weidman and Rockhold previously fought at UFC 194 back in December of 2015. The fight saw Rockhold win via dominant TKO stoppage due to strikes in the fourth round to end Weidman’s historic UFC Middleweight Championship reign and begin his own. Rockhold would go on to lose the UFC 185-pound title in his next outing, suffering an upset knockout loss to Michael Bisping at UFC 199. Since losing the title, Rockhold has gone 1-1, picking up a submission victory over David Branch at UFC Fight Night 116 in September of 2017 and suffering a devastating third round knockout loss to Yoel Romero at UFC 221 in February of 2018 in his last Octagon appearance. For his part, Weidman would go 1-2 since the loss to Rockhold. The former UFC Middleweight Champion also suffered a knockout loss to Romero — via flying knee and punches — at UFC 205 in November of 2016, the first-ever UFC event at Madison Square Garden. He would go on to lose via second round TKO to Gegard Mousasi in his next outing at UFC 210 in April of 2017, before bouncing back with a big third round submission victory over Kelvin Gastelum at UFC On FOX 25 in February of 2018. Weidman-Rockhold 2 joins the UFC 230 card that still does not have an official main event, but will feature Nate Diaz vs. Dustin Poirier in a featured bout. Also scheduled for the 11/3 card in NYC is Yoel Romero vs. Paulo Costa, Ronaldo “Jacare” Souza vs. David Branch, Israel “Style Bender” Adesanya vs. Derek Brunson and more. 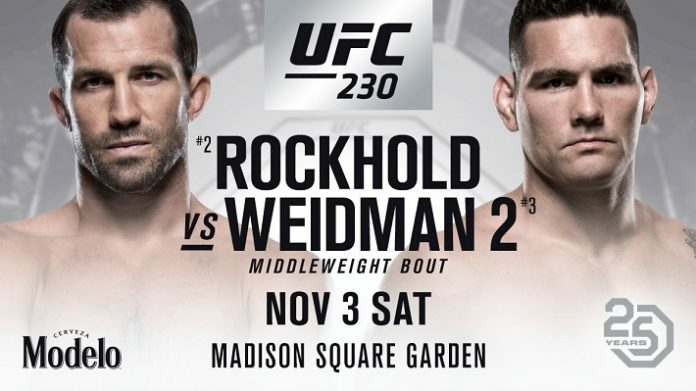 What are your thoughts on the Chris Weidman vs. Luke Rockhold rematch at UFC 230? Sound off in the Comments section below.